What a great jacket to add to your collection - fully lined, and water repellant. 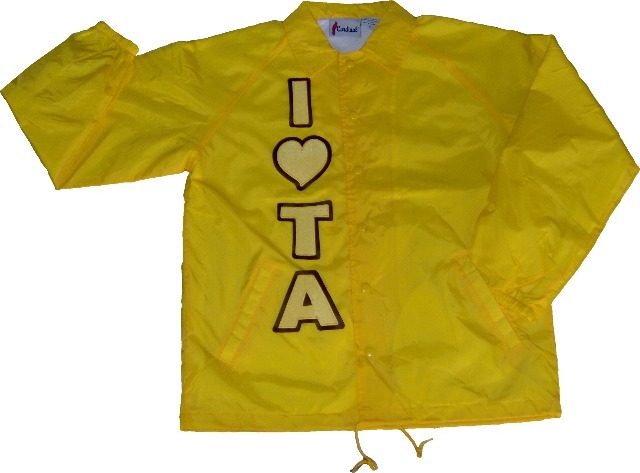 I Heart TA letters and symbol are stitched onto your jacket, offering a long lasting design. Choose your letter colors, and make the heart red if you desire. This item does not already include a design over the chest. Add an embroidered logo - like our cute fuzzy bear or long stem rose - and custom lettering by going back one page. * Augusta Sportswear offers a rich dark brown jacket. However, these jackets are available at an additional charge. And, for small and medium Augusta Sportswear jackets, keep in mind that the placement of their pockets means that the right pocket may be (mostly) sewn closed by the letters. Shown top: Brown jacket, brown letters, yellow gold letter backgrounds, red heart, Informal letter font, teddy with flower chest embroidery. Shown botton: Gold jacket, yellow gold letters, brown letter backgrounds, no red heart, no extras added to jacket.